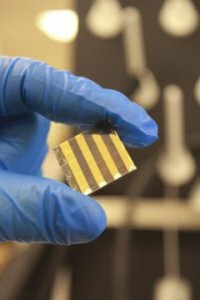 A new study out of St. Mary’s College of Maryland puts us closer to do-it-yourself spray-on solar cell technology — promising third-generation solar cells utilizing a nanocrystal ink deposition that could make traditional expensive silicon-based solar panels a thing of the past. In a 2014 study, published in the journal Physical Chemistry Chemical Physics, St. Mary’s College of Maryland energy expert Professor Troy Townsend introduced the first fully solution-processed all-inorganic photovoltaic technology. This entry was posted in Nanotechnology. Flexible Nanoribbons of Crystalline Phosphorus are a World First - They could Revolutionize Electronics and Fast-Charging Battery Technology. Graphene Batteries – What will it Take to Get Advanced Battery Materials 'Out of the Lab' and into Consumer Markets?